Regular readers here know I’m always up for turning something old into something new. But in the case of wood pallets — those seemingly tempting sources of free wood that sometimes linger outside stores — think twice before bringing them into your home. In the wake of the recent recall of E. coli-tainted romaine lettuce, the nation’s oldest consumer organization, the National Consumers League (NCL), is urging the U.S. Food and Drug Administration (FDA) to set minimum sanitary and safety standards for the “unregulated but crucial” pallets that are used to transport food throughout the United States. The move by NCL comes following recent exploratory tests conducted by the organization on pallets to determine whether they are potential carriers of pathogens, as concerns grow about the link between pallets and contamination of food and pharmaceuticals. The consumer group tested pallets for foodborne pathogens, including E. coli and Listeria. The findings were alarming: 10 percent of the wood pallets tested had E. coli present (though not the most virulent strain, E. coli O157:H7). Wood pallets pose other dangerous risks. Contamination from chemicals used to treat wood pallets was cited in the recent voluntary recall of TYLENOL Arthritis pain reliever. The chemical contamination caused nausea, vomiting, diarrhea and stomach pain in consumers. Wood pallets made with “engineered wood” components contain urea formaldehyde – a known carcinogen – which may come into contact with food under a variety of scenarios when it is stored and shipped on wooden pallets. Formaldehyde is also released into the air when it off-gases from pallets in storage and transportation compartments, posing a risk to the health of workers and consumers. Wood pallets are susceptible to insect infestation and require heat treatment or fumigation before they can be moved cross-border. Fumigation is often performed with methyl bromide, a highly toxic, ozone-depleting chemical. Consumers must be made aware of the serious dangers presented by wood pallets, particularly when reusing wood pallets to make children’s toys. Imagine what might happen if a child chewed on a toy or furniture made from pest-infected, bacteria- and chemical-laden wood pallets? What can shippers do instead? 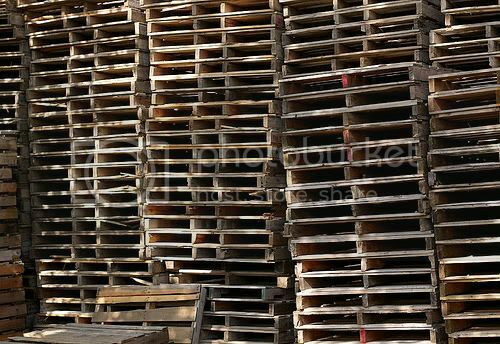 This site makes the argument that plastic pallets are better because they can be better re-used and can be sanitized. I hate to urge anyone to use more plastic. However, this could be a great way to use recycled plastic, and some pallet manufacturers are doing so, although I can’t find statistics online. If you have a business that uses pallets, the Environmental Protection Agency has a cost calculator to help figure the price of using recycled wood or recycled plastic pallets, which are preferable to virgin wood pallets in environmental terms. There is also an online petition circulating on this issue. It seems to be aimed at encouraging plastic pallets. If you’re interested, you can take a look at the petition here.